The 2013 PBA All-Star Weekend, which is set to happen on May 1 to 6 at Digos City, Davao Del Sur Coliseum. The PBA has prepared a lot of surprises for the Fans. One of which is the big time showdown between the Smart Gilas Pilipinas Team vs. The PBA All Stars. It will be held on the final day of the All Star Week. Hopefully, the game between Gilas and the PBA All Stars would help prepare the National Team for the upcoming 2013 FIBA Asia Championship which will be held here in the Philippines this coming August. You may check the team line-ups below. Yap, Caguioa, Abueva and other big time PBA Players will face the Gilas National Team. For sure it will be an action packed game! Lugi sa center at pf position ang all star. Sana isinama kahit 3 imports, sundov,dunigan,bowles or atleast sila y. De ocampo, penissi,eman. 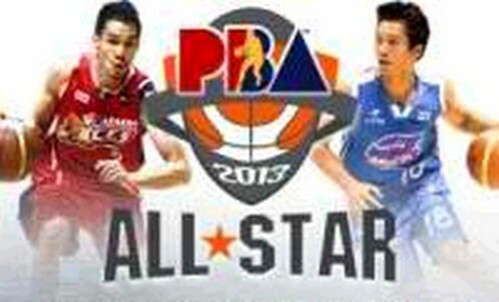 Where can we buy tickets for the PBA 2013 All-Star game? at the BAC Office at the Davao del Sur Provincial Capitol. why most all-star games are held/done on out of towns? (these past few years) how about fellow manila'nians who want to watch the game must fly to davao in order to watch the game? "extra cost for an airfare :( " PBA management should realize that the market and audience here in manila are more/many compared to other provincial cities and most people are now pissed-off because of such decisions done, we (manila'nians) can't watch the game live! The players and pba mgt probably pissed off with the traffics and polution in mla. You may not be aware big time bettors and sports afficionados are coming from mindanao..also its a good way promoting pba accross the country..